How Much Work Do I Have To Miss To Receive Temporary Total Disability Benefits? | Pothitakis Law Firm, P.C. How Much Work Do I Have To Miss To Receive Temporary Total Disability Benefits? Workers all over Iowa experience a wide variety of injuries and illnesses every year. Some recover very quickly and miss little or no work, while others face severe injuries and extended periods away from the job. More commonly, an employee finds himself somewhere in the middle. He suffers an injury, misses some amount of work, and then returns to the job. Typically, these workers are eligible for temporary total disability (TTD) benefits. Temporary total disability benefits are appropriate for Iowa workers who suffer an injury on the job that prevents them from working in any capacity. It is necessary for a doctor to determine if the employee is capable of performing any job functions. Typically, employees receiving TTD are expected to recover and return to work after some period of time. These benefits comprise two main components: payment of medical bills and wage replacement compensation. Medical coverage encompasses all reasonable and necessary care related to the work injury. Wage replacement is meant to prevent unnecessary hardship created when an employee is forced to miss work and subsequently lose income. Medical care benefits are available for treatment of any work-related injury, whether the injury forces an employee to miss time at work or not. Medical care benefits can include a number of charges, including doctor visits, medications, hospital stays, surgery, rehabilitations, travel to appointments, and more. Medical only claims are common, and an employer (or its insurance company) would pay all bills related to the work injury. It is important to note that in Iowa employers have the right to choose the provider of the medical care. 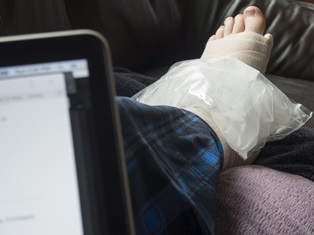 Injured employees should report their injury as soon as possible, and the employer should offer direction as to how to find the appropriate provider. Wage replacement benefits exist to help injured employees and their families avoid the financial hardship that may accompany missed work. It is necessary, however, to miss a certain amount of work before wage replacement benefits are available. In Iowa, an injured worker must miss at least three days of work to be eligible for wage replacement. Typically, payment begins on the fourth day of missed work and continues until the injured worker returns to the job or is medically cleared by a doctor to return to work. If the employee misses more than 14 days due to the injury, workers’ compensation will pay back the initial three days of missed work. Workers will not be paid for those three days if they are able to return to work before 14 total days are missed. While workers are entitled to compensation beginning on the fourth day of missed work, the actual receipt of payment can be expected the following week. State law provides weekly payments beginning on the 11th day of disability. The law encourages prompt payment, and employers or insurance companies who are late with paymentsunnecessarily are subject to penalties. The rate of payment in Iowa is among the most generous in the U.S. Typically, injured employees are eligible to receive up to 80 percent of their total weekly spendable earnings. The amount is subject to set minimums and maximums, which are determined each year by the state commission. The current weekly maximum is $1,572. If you or someone you love has suffered an injury at work in Iowa, you may be eligible to receive workers’ compensation benefits. At Pothitakis Law Firm, our experienced legal team has represented many injured workers and helped them receive the maximum amount of compensation available. Browse some of their experiences on our case results page, and call our office to find out how we may be able to help with your claim. Previous PostPrevious Is Workers’ Compensation The Only Source Of Income After A Work Injury? Next PostNext Do I Have To Use Workers’ Compensation After An Iowa Work Injury?